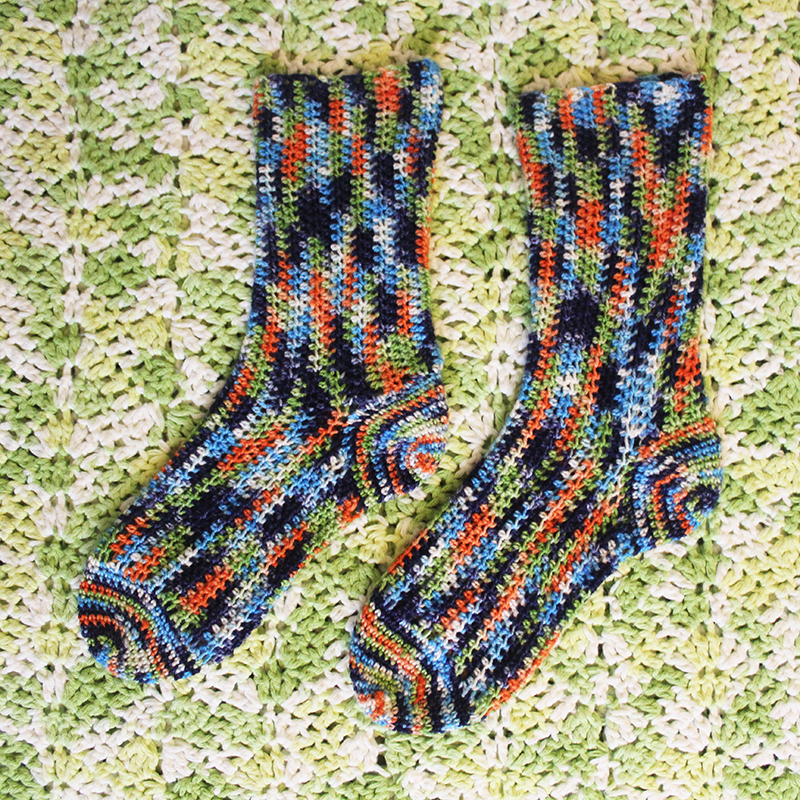 For the month of August I wanted to try something a little different, so I chose a sock pattern that is actually worked flat. It was surprisingly easy to do! Here’s how a sock is constructed using this method. First you crochet the body as a long rectangular piece of fabric. This will be the top of the foot and the front of the leg. Next, you crochet the bottom of the foot by only crocheting into 1/3 of the body stitches, leaving the rest unworked. After this, you attach your yarn in one of those unworked stitches and crochet the same number of rows as the foot to create the leg. When you fold this so that the edges meet and sew it up, you get a tube with a hole for the heel. Pretty cool! Then all you have to do is crochet around each opening to create the toe and the heel. The really neat thing about this pattern is that you use the same instructions for crocheting the heel and the toe. My only concern with this construction is that the ankle is quite tight. Even in the pattern’s main photo the stitches at the ankle seem to be stretched. The heel could be a bit wider I suppose. It’s also important to note that unlike toe-up socks, with socks worked flat like this, you can’t make any adjustments as you go. Therefore it is highly recommended to make a gauge swatch before beginning these socks. All in all, this was a fun pattern and I recommend it for anyone who would like to try something new. 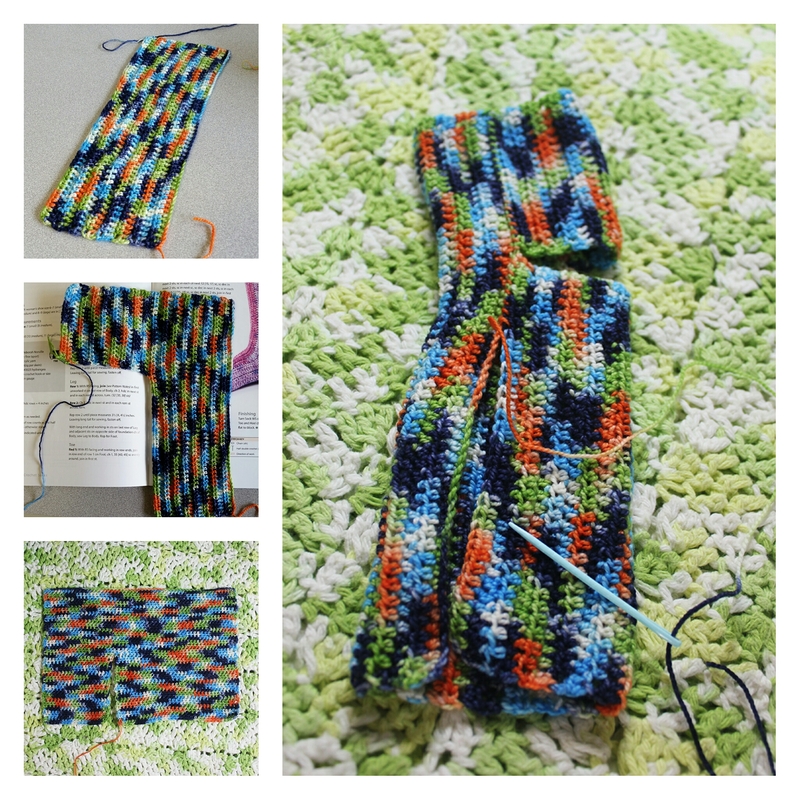 Categories: Year of the Sock | Tags: crochet, sock construction, sock crochet, Year of the Sock | Permalink. my sock envy continues but I am making notes because I am promising myself I will be making some, eventually. ps. Shane has an after school job as a gymnastics coach with little kids. Brilliant on so many levels! 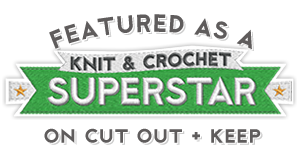 There is simply never enough time for all the projects I want to crochet, so I can totally relate. Luckily there are patterns for socks that whip up pretty fast. If you ever want a recommendation let me know. Congratulations to Shane! I can totally see him as a coach. Those are some lucky little kids. What a fun time they all will have! Thanks, Karin! I’m planning on giving this pair to my mom. I hope she will like the colors too. I think they are unique!